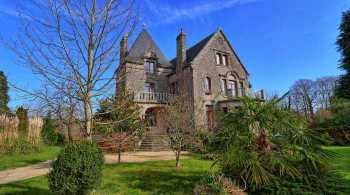 Properties for sale in Brittany, France - AHIB-2-DN-700 Guémené sur Scorff 56160 9 bedroomed neogothic mano rhouse with 13 acres! Set in the heart of a village close to the popular market town of Guémené sur Scorff is this amazing fully renovated neogothic manor house with its adjoining 13 acres of land! The property was built between 1927 & 1931 and was completely renovated in 2005 to become a unique country home. On the ground floor you have an immense living room with different seating areas, whether it be by the fireplace, the bow window or in the dining area, as well as a fully fitted kitchen and a second private lounge and a downstairs cloak room. On the first floor, accessed by the spiral staircase in the tower, are five bedrooms all with ensuite bathrooms or shower rooms. Then on the top floor you have a further 4 bedrooms, a storage room, shower room and separate toilet. On the garden level you have a large utility room, a snooker room with fireplace, single garage and toilet and showers for the pool users. The pool is heated by the geothermal heating that also heats the house. There is also a pool house with kitchen, toilet and outside barbecue area. As well as an old 18th century longère, which has a good roof, but need internal renovation. This could develop into three separate letting units, workshops or garages, the choice is yours. Fireplace, Double glazing, Internet, Furnished, Outdoor lighting, Well, Swimming pool.